On 13 March 2013 the Atacama Large Millimeter/submillimeter Array (ALMA), the largest ground-based astronomical project in the world, will be inaugurated, celebrating ALMA’s transition from a construction project to a fully fledged observatory and marking the milestone of all the major systems of the observatory being operational. More than 50 of ALMA’s antennas will be in operation, and all 66 will be fully assembled. The inauguration ceremony will take place at ALMA’s Operations Support Facility (OSF), 34 kilometres from San Pedro de Atacama, in Chile. ESO is the European partner in ALMA. 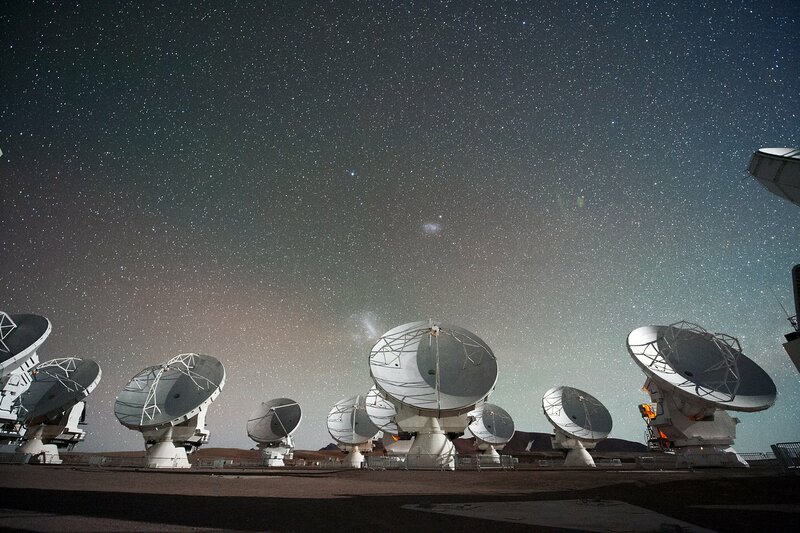 The President of Chile, Sebastián Piñera, along with representatives from the global scientific community, current and former ALMA personnel and its executives, as well as the communities located near ALMA, will be present to celebrate the success of the project. Members of the international media are invited to submit applications of interest in advance to attend this astronomical milestone. Media attendance will be limited due to security and safety constraints related to the presence of government authorities and the site conditions in the Atacama Desert. Write a letter that explains the coverage that you will commit to providing, and the number of people in your party. All applications will receive a response by close of business on Friday 21 December 2012. For the selected members of the media, ALMA will organise a one-day tour before the inauguration event. This media tour will take place on 12 March and will consist of an introductory talk explaining the ALMA project and its capabilities, a trip to the Chajnantor Plateau (5000 metres above sea level, the final destination of the antennas, from which ALMA observes the Universe), lunch and a guided tour of the Operations Support Facility at 3000 metres (where the offices, laboratories and antenna assembly sites are). Invited members of the media must arrive in San Pedro de Atacama the day before the tour (11 March) for acclimatisation to the altitude in order to be able to visit the high-altitude site. They also have to pass a medical check-up at the ALMA premises. Unless otherwise communicated, attendees will be expected to cover their own travel costs to and from San Pedro. ALMA will provide transportation between San Pedro and the observatory. For members of the media who cannot be present at the inaugural event, ALMA will host an online press meeting via Adobe Connect on 12 March. A separate media advisory for this will be issued in the weeks leading up to the inauguration. Although construction is ongoing, ALMA has started scientific operations with the partial array of antennas that is already available, opening exciting opportunities for astronomers and scientists worldwide. These scientific advances will not only yield concrete answers to specific queries, but will also contribute to mankind’s overall quest for knowledge about its origins and the principles of life. The Atacama Large Millimeter/submillimeter Array (ALMA), an international astronomy facility, is a partnership of Europe, North America and East Asia in cooperation with the Republic of Chile. ALMA is funded in Europe by the European Organisation for Astronomical Research in the Southern Hemisphere (ESO), in North America by the U.S. National Science Foundation (NSF) in cooperation with the National Research Council of Canada (NRC) and the National Science Council of Taiwan (NSC) and in East Asia by the National Institutes of Natural Sciences (NINS) of Japan in cooperation with the Academia Sinica (AS) in Taiwan. ALMA construction and operations are led on behalf of Europe by ESO, on behalf of North America by the National Radio Astronomy Observatory (NRAO), which is managed by Associated Universities, Inc. (AUI) and on behalf of East Asia by the National Astronomical Observatory of Japan (NAOJ). The Joint ALMA Observatory (JAO) provides unified leadership and management of the construction, commissioning and operation of ALMA. Please apply by filling out the ESO media visit form, noting that you wish to attend the ALMA inauguration under "Objective of the Visit."